I have a 2008 5.7 Aspen with 130k. The steering is almost too easy to turn if that makes sense. I bought this used so I am not sure how it felt when it was new. Normally, I would not care, but it makes driving a little more difficult when the wheel turns this easy...especially at highway speeds. Is there away to remove out any remaining play and add resistance to the steering wheel by adjusting the rack or linkage to get that "new car/tight" feel back? Any help on the steering issue or any other maintenance items I should look at would be greatly appreciated. Did you ever have a American car before you bought this truck? Almost all American cars are loose when you steer them. If you want a tight steering get a foreign car. I had a bmw and a nissan before i got my chrysler aspen and the steering is totally different. sorry for replying so late for this thread. I have the same issue. Steering is way to loose. I dare not to drive with one hand. Any update? I had the same issue. It ended up being the bushings for the rack and pinion itself that connect to the front cross member. They are hard to find, but I took them out, measured them, and ordered some poly bushings the same size. They actually come in two pieces per side. (they are halved) Took out all the play. Cost me $26. Here is a link that shows what I am talking about. At ~6:08 you see the loose bushings. Thx Lesterrobertson. I will check that video out closely. I actually seen this video on youtube. Would you mind sharing part #'s if you have it. Seems like a pretty inexpensive fix. I will check it out. Very nice find. I just thought the little "slop" was normal for an American SUV. Might have to look in to doing this as well. Those part numbers would help greatly. So, I was looking underneath my truck after looking at your video. Then I stared thinking...what am I actually looking for. I took a snapshot of your video and hope any of you can point out exactly what to look at. I can't see your snapshot picture for some reason so I made my own real quick. From what I'm understanding (and seeing in the video) around 6:08 in his video you start to see the rack and pinion actually moving side to side when it shouldn't. 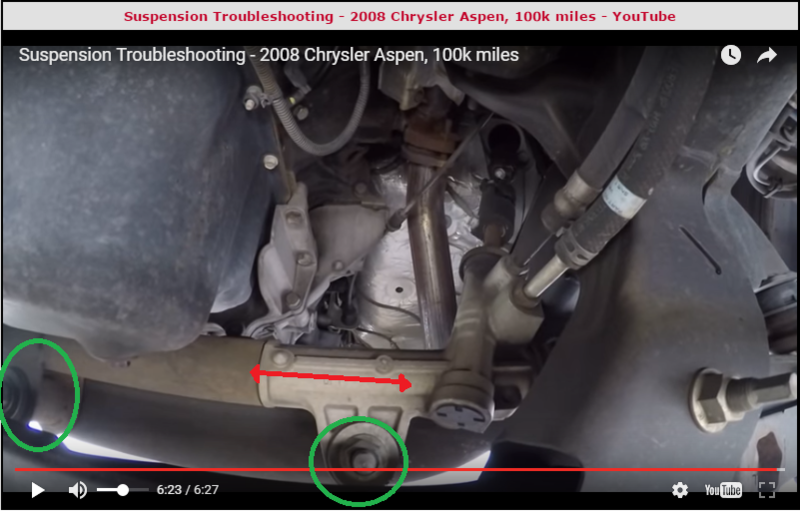 I believe the bushings he is talking about are circled in green on the image I posted. The red line with the arrows on each end is to mark the rack and pinion moving back and forth. Watch the video around the 6:08 mark again and watch it move. Use other parts of the frame that are not suppose to move as a reference point to it. It's real slight, but you can see the R&P move. I can see how this slight movement could be causing the slack. Last edited by calamity coyote; 08-27-2016 at 11:21 AM. This one is not easy to solve i need HELP!!! Might have a easy "Q"